Which, I am loving. Strawberries are at their peak of deliciousness right now and I cannot get enough. But umm, you guys? 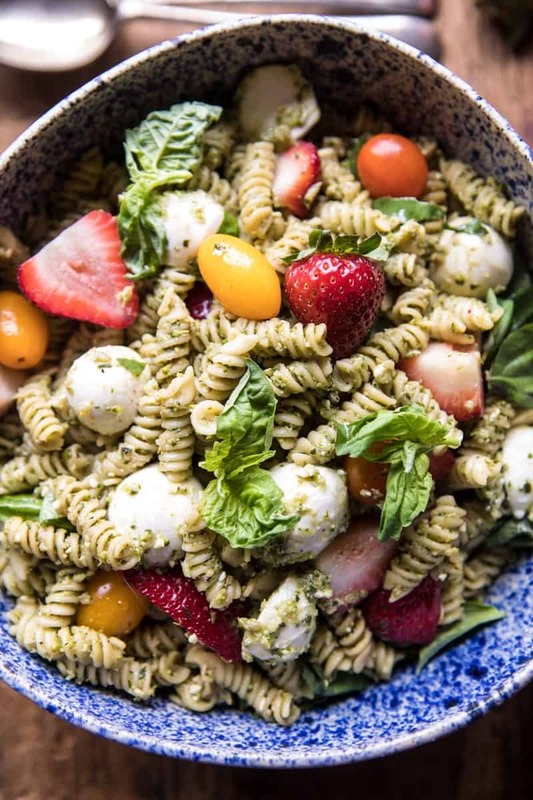 Does the idea of strawberries in your pasta kind of freak you out?? 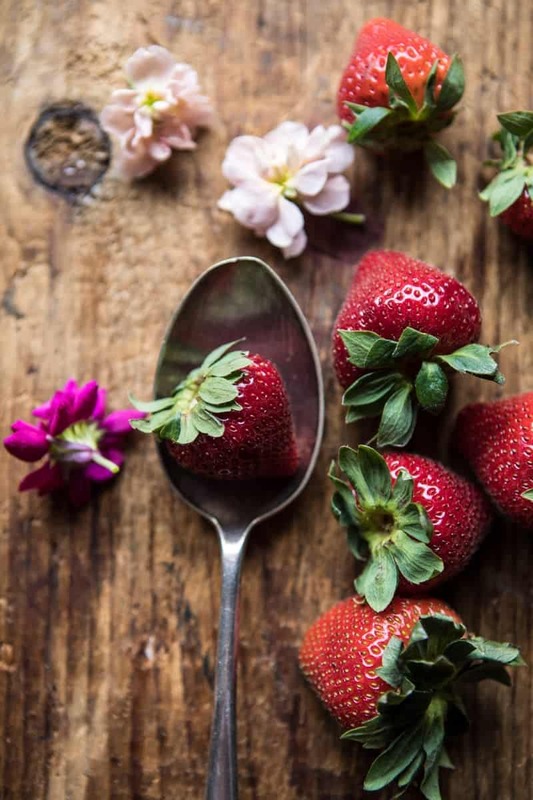 I am so very much hoping you can be open-minded to the idea and give it a try because it’s a game changer, and honestly just a really fun savory way to eat up all the these late spring strawberries. For years now you guys have known me to come up with some pretty crazy combos, a lot of those combos involve fruit (hello to everyone’s favorite Peach Burrata Pizza with Honey Balsamic). 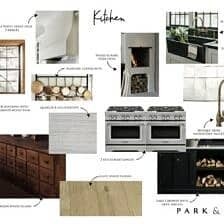 <– because I am fruit obsessed, and a true believer that cooking with fruit is just as delicious, if not more so, than baking with fruit. For the longest time though, I’ve wondered about putting strawberries in pasta. 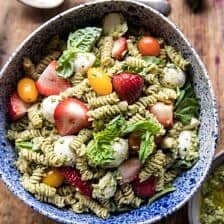 It was just a combo I was always a little too afraid to try, but something changed this year when the thought of strawberries in a pasta salad with pesto and mozzarella came to mind. I mean, how could a flavor combo like that not be just delicious? I was still a little unsure of how I’d like strawberries paired with pasta. But you know, the bottom line is that pasta is a carb, just like toast, and just like strawberries on toast is delish, strawberries tossed with pasta is also delish. Trust me, I promise…so good. 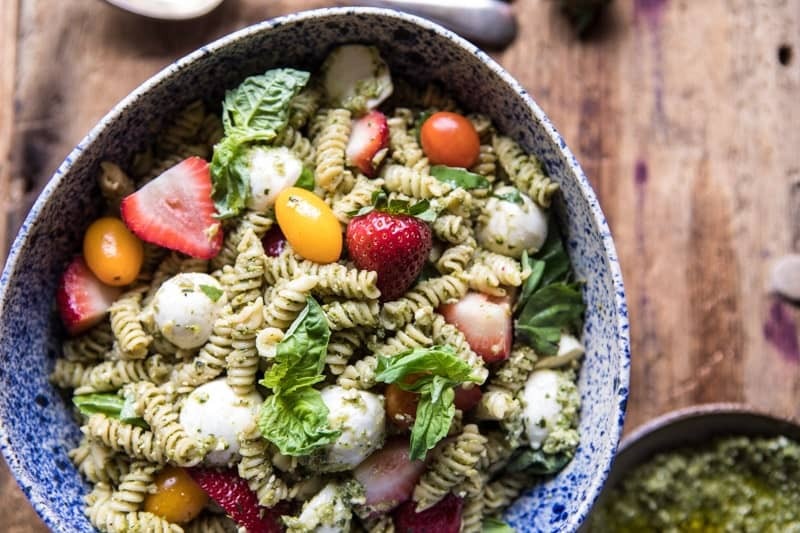 Because I wanted this pasta to be packed with savory flavors to help really highlight the sweet strawberries, I decided on making a different kind of pesto. Instead of the traditional basil, pine nut, parmesan, olive oil combo, I went with steamed broccoli (for a super green color and added veggies), avocado (for creaminess, plus I love avocado and strawberries together), fresh basil, lemon juice, and feta cheese. 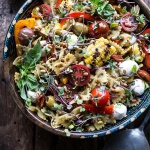 Totally not traditional, but perfect for this non-traditional pasta salad. 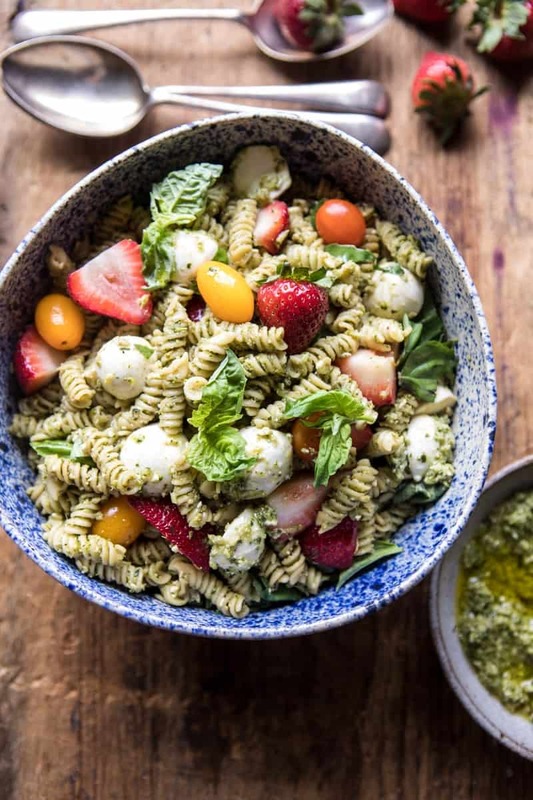 The creamy pesto is amazing tossed with pasta, and the salty feta balances out the sweet strawberries so well. I love the combo. This salad is the perfect lunch, light dinner, or side dish for any upcoming picnics or parties. Basically Memorial Day and just about every other weekend after that. Because summer is all about pasta salads. Or at least that’s my thinking since pasta salads were a staple my dad used to make all summer long…they were always a favorite. ps. 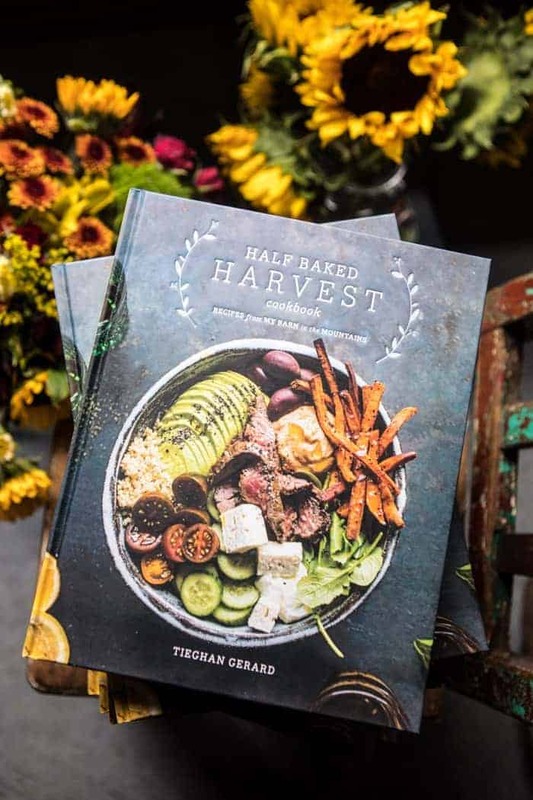 look out for his pasta salad recipe in the Half Baked Harvest Cookbook. 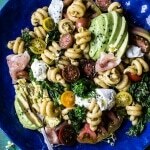 And of course, like most pasta salads, this one is EASY. The base of the work goes into making the pesto, which takes maybe fifteen minutes tops. Then just toss everything together and DONE. Also, I used fresh mozzarella balls, but I think if you threw on a few balls of fresh burrata cheese that would be kind of amazing too. It’s just a suggestion…but I mean, it is burrata so you should prolly give it a try. 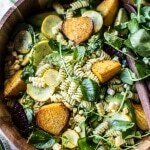 Thursdays just kind of seem like a pasta salad day? Maybe that’s because I’m completely in the mood for pasta today. It’s been a bit of a hectic week and pasta just sounds good. While I’m waiting for your responses, I’ll be eating this pasta salad. Yes and yum! 1. Steam the broccoli until tender, about 5 minutes. 2. In food processor or blender, combine the broccoli, avocado, basil, olive oil, lemon juice, and a pinch of salt. Pulse until combined, adding olive oil if needed to thin. Add the feta cheese and pulse until combined. 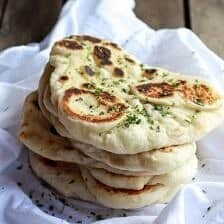 Taste and season with salt, if needed. 1. Bring a large pot of salted water to a boil. Boil the pasta according to package directions until al dente. Drain. 2. 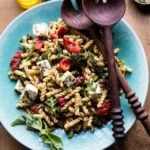 Add the pasta to a large salad bowl and toss well with the pesto. Add the balsamic, mozzarella, strawberries, tomatoes, and basil and gently toss to combine. Serve cold or at room temperature. Enjoy! Thursday is looking pretty good…killin’ it with the strawberry recipes this year! Thanks so much Leanne! I hope you love this! I always hesitate to add fruits to my salads. 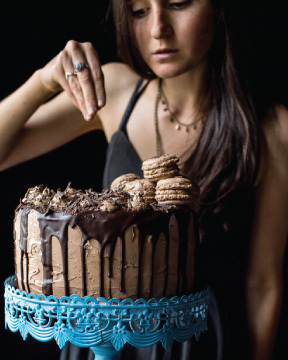 But, I’m up to the challenge and I will try your recipe. Awesome! I hope you enjoy it Carlos! Thank you! 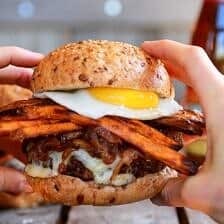 Hot DAMN this looks delicious! 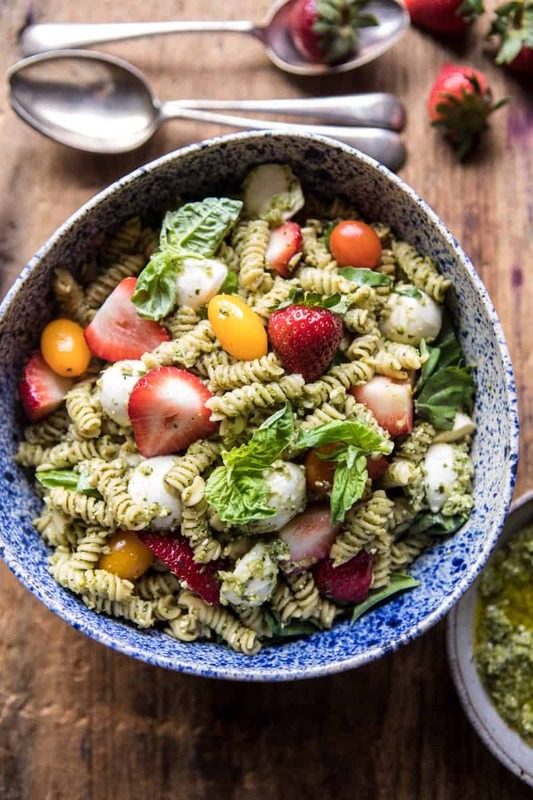 Strawberries are so good right now, and the idea of their sweetness with the salty pesto and cheese just sounds heavenly. Definitely trying this, thank you!! So thrilled you are loving this salad & I hope you enjoy it! Thank you Kelly! I LOVE this idea! Strawberries with feta? FAVE. I would like to see you make the lemon roasted broccoli salad on FB live. It has literally become a staple in our house 🙂 Or that cute rhubarb cocktail I saw not that long ago here. Glad you are liking this Amanda & I totally keep that in mind! Thank you so much!! Hey Gia! 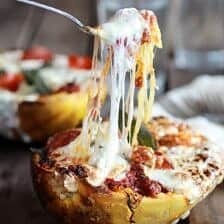 So I LOVE cheese and personally would not make it minus the cheese. That said, I do think it would still be flavorful and yummy…I just need cheese. LOL! Let me know if you have questions. Hope you love this! Ooo that restaurant sounds so good!! Thank you Heather! I make a very similar pasta salad regularly. It’s a real family favourite. Mine has sundried tomatoes where you have strawberries, but I am eager to try it with strawberries. Strawberry season starts in a few weeks here in Scotland. I can’t wait. It’s my favourite time of year. Shared! Ooo sundried tomatoes sounds so good too! I hope you love this salad, Jacqueline! Thank you! Yes please, this is the perfect summery salad! 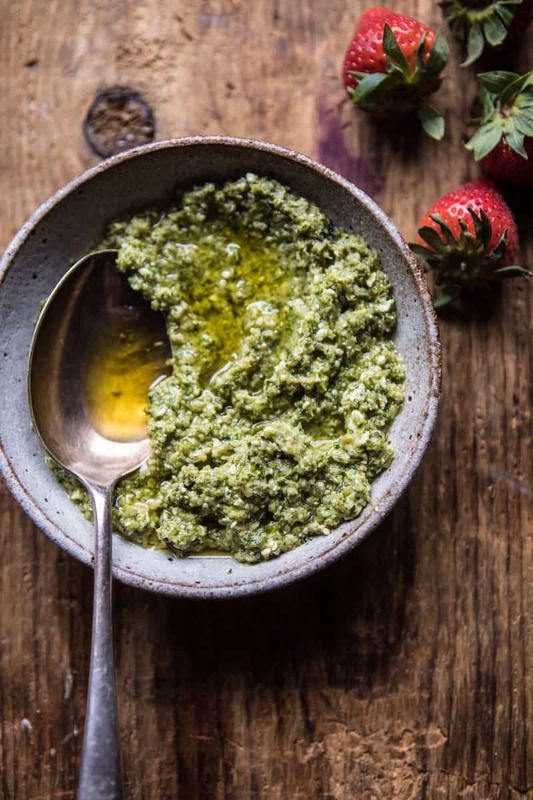 I’m loving the pairing of pesto with sweet strawberries! Yes!! Glad you like the combo, its one of my new favorites! This was easy and delicious! Our local sweet Ontario strawberries are just starting! So exciting strawberries are starting to be in season! Thanks Kimberley so happy you like them! I’m not a fan of feta cheese, so I left that out and substitued a teensy bit of normal pesto, but this was still absolutely delicious! I adore strawberries at this time of year, they’re just the best. That sounds like it would be yummy!! So happy you liked it Julia! Thank you! I made this the other day. It’s just me, so I’ve been eating it all week. It’s so good!!! I highly recommend trying it out because I was also skeptical about strawberries and pasta. But omg it’s so yummy. Wooo! So glad you are loving this Meagan! Thank you! Do you think peaches would work in place of the strawberries? Our local peaches are amazing right now! Made this today for a pool party and everyone enjoyed it even the babies and toddlers! Sounds so fun, and so happy it was a hit, thanks Katherine! I’m a little late the the party here, but this looks amazing. Do you think it would hold up well if I made it Friday morning to be served Saturday afternoon? Thanks! Would goat cheese work instead of feta? I just love goat cheese. Hi Elena! I am sure it would taste amazing! I hope you love this!